It’s Debate Day on Trope and Dagger! This week we’re discussing the best Pixar movie. Last week we looked at the best computer animated Disney movie, and next week we’ll be wrapping up this theme with the best traditionally animated Disney movie. To view Aaron’s silly words on the subject, click here. Pixar has captured our imaginations with their stunningly realized fantasies that exist on the fringe of the reality we all inhabit. The company is most well known for pioneering cutting edge computer graphics, but it’s their relatable characters and human compassion that make their movies compelling. While every entry in their canon features genuine characters and emotional resonance (with the possible exception of Cars 2), there’s one that stands out for me above all the rest: WALL-E.
WALL-E (2008) is really unlike any other Pixar movie. It was a huge risk for the company to take, and in some ways it’s amazing it even got made. The movie deserves accolades for its ambition and format alone. The first half of the movie is essentially a story about a single character who is almost completely silent. There’s almost no speech in this part, save for a few garbled words from our robotic hero and some clips from “Hello Dolly.” There’s no villain and very little action. Instead, we learn about our main character’s solitary existence – his hopes and his disappointments – through watching him go about his day to day life. WALL-E, “voiced” by Ben Burtt, is one of a massive series of robots built to clean up the earth after the humans trashed it beyond livability and left. (His name stands for “Waste Allocation Load Lifter – Earth-Class”). Unfortunately, the creators of the robots, the Buy ‘n’ Large corporation, abandoned the plan and had all the robots deactivated. Our WALL-E, however developed sentience, and refused to give up the mission. He’s been at it, mostly by himself, for 700 years. The task, unfortunately, is insurmountable. WALL-E shovels trash tirelessly, compacting it and stacking it in skyscraper-like towers, using salvaged parts from his fallen comrades whenever a part of him breaks down. When he’s not picking up trash, he salvages a collection of human artifacts, which he cares for lovingly. The movie really picks up when WALL-E discovers a seedling: green life where it was thought nothing could ever grow again. Another robot arrives on earth from parts unknown, sent by the BnL corporation. This new robot is EVE, a slick, smooth white oval, much more advanced than WALL-E, and equipped with high-powered weaponry. 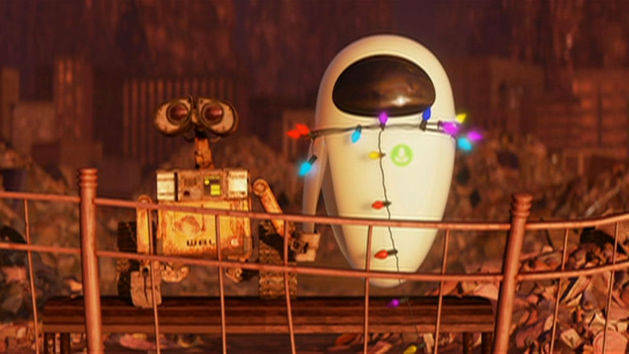 WALL-E is immediately smitten, but EVE, voiced by Elissa Knight, is initially cold, not knowing what to make of the ancient robo-janitor. She eventually befriends WALL-E, and he shows her the seedling, which EVE promptly stores inside herself before going into hibernation. As EVE’s ship returns her to space, and WALL-E hitches a ride, the film transforms into a more traditional narrative. The bots arrive on the Axiom, a starship populated by the descendants of human refugees. The humans, led by Captain McCrea (Jeff Garlin), have had most of their muscles atrophy from their time in space, and are now like overgrown babies. Yet the seedling EVE brings back will allow the ship to warp back to earth, where the humans can recolonize it. Unfortunately, the ship’s auto-pilot, Auto, has other plans. BnL has deemed earth permanently uninhabitable, and Auto takes it upon himself to use his army of maintenance bots to destroy WALL-E and the seedling. Ladies and gentlemen, we have a villain. I don’t want to spoil the ending, but there are some elements you can easily predict: other robots following WALL-E’s chaotic example, humans learning to function without their hoverchairs and video screens, and EVE developing free will of her own and affection for WALL-E. There’s heartache and sacrifice, but the movie ultimately has a happy ending. The second half of the movie is an awesome ride. We get to see WALL-E interact with other robots on the Axiom, and impishly fly in the face of their programmed directives. Some are merely annoyed at his antics, while others, like the giant and imposing WALL-As, are downright hostile. The infantile humans are hilariously stupid, but some, like John and Mary (voiced respectively by John Ratzenberger and Kathy Najima), are snapped out of their waking trance by encounters with WALL-E, and meet face to face, forming a strong bond. Captain McCrea seems perhaps incompetent at first, but becomes a true hero when he challenges Auto for command of the Axiom. But it’s the first half of the movie that truly makes WALL-E special. Director and writer Andrew Stanton took a daring leap of faith by conceiving a movie where audiences must rely on body language and robotic sounds to convey all the emotion and information that has to pull in an audience. Hollywood nowadays generally thinks audiences are stupid, and this is reflected in the patronizingly dull and exposition-heavy movies they crank out year after year. WALL-E, in contrast, believes in its audience, and challenges them. Their faith paid off. WALL-E was a smash at the box office and received universal critical acclaim. It bagged a slew of awards, among them the Oscar for Best Animated Feature. In a first for Pixar films, WALL-E features a live-action component. Fred Willard appears onscreen as Shelby Forthright, the CEO of BnL at the time of the evacuation of earth. We see him in recorded messages explaining the dire situation in a relentlessly upbeat and optimistic fashion. Also worth noting is Sigourney Weaver as the voice of Axiom’s computer. Auto isn’t voiced by a human at all, but rather by MacInTalk, Apple’s text-to-speech program. Neat, huh? It’d be easy to put WALL-E on a pedestal for its technical achievements alone, but it isn’t necessary. 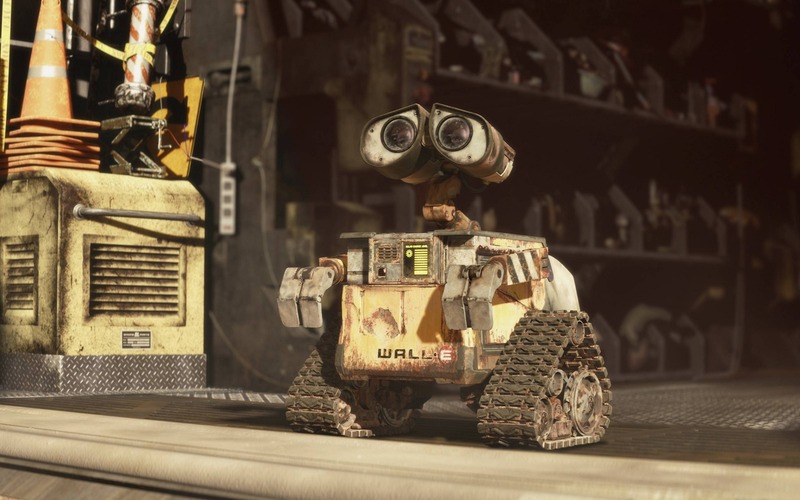 WALL-E isn’t an independent movie that skates by on a neat concept but no substance. The movie has a powerful heart driving it, like all Pixar films, and you’d have to be a monster to not be touched by WALL-E’s story of isolation, finding love, and fighting to hold onto it and save humanity in the process. That’s what makes WALL-E the best Pixar movie ever. So who’s right? Andy or Aaron? Let us know in the poll below!